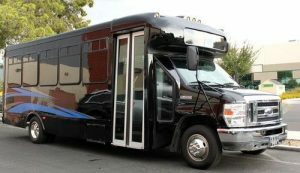 Why Indianapolis Party Bus Service? Indianapolis party bus service provides you with a comfortable ride to some of the most popular places throughout Marion County, Indiana. Celebrate with your friends and family in the largest city in Indiana as we arrive to your wedding, bachelor party, bar crawling, sweet sixteen, and more. Make a reservation in one of our many Indianapolis shuttle buses such as our 18 passenger limo bus, 30 passenger party bus, and 40 passenger coach bus. View More Photos & Pricing Indianapolis party bus rentals provide you with a professional chauffeur service that can take you to some of the most recognizable bars in Downtown Indianapolis. Make your way to Subterra Lounge, Howl at the Moon, Blu, or Chatterbox Jazz Club just to name a few. Celebrate a bachelorette party, divorce party, bachelor party, or bar crawling with your friends. Our chauffeur service is your designated driver for the evening as we arrive to your destination in our Indianapolis party bus rental. Make plans to check out the Indianapolis Colts and Indiana Pacers pay against their division rivals. Arrive to Lucas Oil Stadium for all of the pre-game fun outside the stadium as you sit back and wait for the gates to open so you and your party can walk into the stadium and enjoy the game. Watch any pre-game shows in our Indianapolis party buses as you make sure that your team is ready to step on the court in Conseco Fieldhouse and start making a push towards the playoffs. If you enjoy racing allow us to provide you with transportation to the Indianapolis 500 or the Brickyard 400. Our Indianapolis party bus service will have water, soda, and ice in the vehicle especially during the long hot days of racing. The biggest game of the NFL season comes down to what happens at Lucas Oil Stadium on February 5th, 2012. Do not be left without a vehicle for hire on the biggest day of the year. Allow us to provide you with transportation service with one of our party buses in Indianapolis. Make your way to the all day festivities at the stadium and throughout Downtown Indianapolis. Super Bowl Sunday is going to be very busy and having to drive and pay for parking is not the way to go. 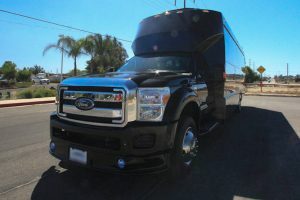 View Our Inventory All of our Super Bowl party bus service in Indianapolis makes it easy for you and your friends to sit back and enjoy the ride while our professional chauffeur service takes care of your driving needs. If we get stuck in traffic as we creep even closer to the stadium turn on the television in the vehicle and watch some of the pre-game talk as you and your friends sit back and debate what you expect to see in the game from your favorite team. If you are not sure you want to make your arrival in an Indianapolis party bus allow us to provide you with an alternative selection such as our Indianapolis limo rentals. 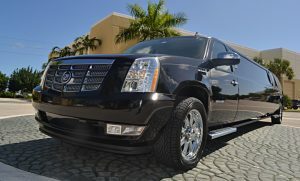 Ride in one of our luxury vehicles for hire to celebrate a wedding, night on the town, bachelor party, and even a sweet sixteen. Allow us to take you to your destination anywhere around the largest city in Indiana as we arrive to Lucas Oil Stadium for a big football game, airport transfer to Indianapolis International Airport, or corporate event being held at the Indiana Convention Center. Our limo service in Indianapolis has you covered with all the services you need to make your arrival a memorable one no matter where you plan to go. You can find yourself riding in a Hummer limo, Chrysler 300 limousine, or Lincoln Stretch limo as we arrive to your destination.